CLEARWATER, FL, US, November 29, 2018 /EINPresswire.com/ — On Saturday December 1st, the Scientology Information Center will host a different kind of “miracle” during the City of Clearwater’s Miracle on Cleveland Street festival. Starting at 6pm children and their parents can enjoy old-fashioned caroling together. A reception will be held from 5-10pm. 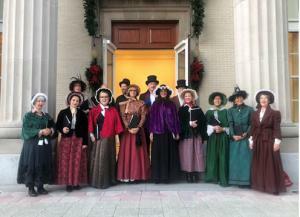 The Church of Scientology Choir will sing traditional Holiday carols on the steps of the Information Center in Victorian-style costumes. The performers will also stroll along Cleveland Street before the concert downtown and will resume performing in the Information Center once the concert starts. Guests are welcome to sing along. Holiday treats, including hot chocolate, will be provided at the reception for drop-in visitors and those interested in learning about Scientology. The Info Center hosts a gallery of informational panels and a multitude of videos on display covering the beliefs of Scientology, Churches around the world and about the life and history of Scientology’s founder, Mr. L. Ron Hubbard, and more. Continuing to celebrate the season, on December 7th, the Scientology Information Center will host a Holiday Concert with Ms. Joanie Sigal from Broadway and Beyond who will help ring in the holiday season with an eclectic mix of favorites from Broadway to romantic ballads, pop to blues with a selection of well-loved holiday favorites.